Classical Net Review - Liszt - Piano Concerto #1, Orpheus, etc. These recordings will be a trip down Memory Lane for older collectors. When I was in high school, I owned the Audio Fidelity LP of this particular Tasso. (It was coupled with Liszt's Piano Concerto #2, with pianist Hanae Nakajima, and the oddly-named Rato Tschupp conducting some German orchestra – possibly also the Nurembergers.) Although one might guess that "Max Loy" is a pseudonym, he really did (or does exist), and his name still turns up on various budget CD collections, usually associated with the same orchestra. The quality of the orchestral playing on this Tasso is very acceptable, and Loy deserves praise for downplaying bombast in what is essentially one of Liszt's more bloviating tone poems. ReDiscovery's remastering has greatly improved the sound of the LP, at least as I remember it. Some of these artists did, in fact, find their recordings appearing in editions attributed to pseudonymous performers. When Sergio Fiorentino's 1958 recording of Liszt's Piano Concerto #1 reappeared on other labels, the pianist was renamed John Johnson or Fritz Kermann, or worse, became anonymous. Today, Fiorentino has become something of a cult pianist, and some collectors have made a pastime of identifying his pseudonymous recordings. (Some recordings also have appeared under his name that appear not to be his work, but that is another story!) Fiorentino was only 30 when he made this recording, but he was in what might be called his second career, as he had taken several years off from performing following a plane crash in 1954. Again, what we have here is a recording in which the pianist tones down some of the more tasteless aspects of Liszt's muse, although the conductor and the orchestra (listed as the Hamburg Pro Musica, but really the North German Radio Symphony Orchestra, sounding a bit seedy here) don't always agree with Fiorentino's interpretation. Still, it's an interesting reading, and one that reveals what all the fuss over Fiorentino is about: the playing is powerful, and Fiorentino's tone is many-colored. The remastering doesn't hide all the faults in the source material, but it is largely free of noise. 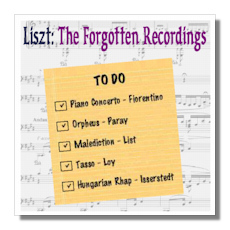 The CD closes with an exciting performance of Liszt's Hungarian Rhapsody #2, this time led by a conductor who was more difficult to pigeon-hole than Paray, although he is remembered today chiefly for his Decca recordings of Beethoven's symphonies and piano concertos. On the original LP release, the orchestra was called "The Festival Orchestra." It has been identified as the North German Radio Symphony Orchestra, which the conductor founded in 1945 and led for more than 25 years. Schmidt-Isserstedt doesn't use any cheap tricks here; he lets the music's innate color and verve do the work, and the results are enjoyable, and they don't leave one feeling slightly embarrassed, as is sometimes the case with this piece. ReDiscovery's David Gideon remastered these performances from LP, but there's very little here to remind one of the fallibility of that medium. The warmth of the originals has been preserved, however. The CD-R can be purchased at www.rediscovery.us for $15, which includes shipping.